My buddy Alan has been downsizing his record collection over the past ten years or so. During his most recent cull, I went through his records to make sure there wasn't anything I needed. Well, naturally there was, after all, I always need more records. The things I was most excited to pull were Treepeople, Jolt and Odd Numbers 7"s.
This Odd Numbers 7" is actually the one I've been wanting to add to the collection the most. 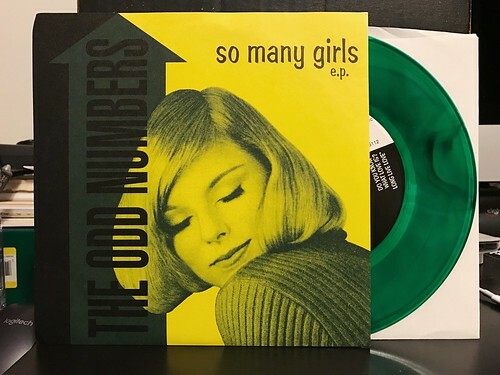 "So Many Girls" has long been my favorite Odd Numbers song, ever since I heard it so many years ago on their Jazz Cigarettes album. It's bouncy guitar chord progressions (knowingly similar to "Everybody Needs Somebody To Love") combined with the catchy mod influenced vocal melody has stood the test of time for me. I love it just as much today as I did the first time I heard it. The other three songs may not be as good as "So Many Girls," but really how could they be? Still, the two of the three are pretty fantastic. "Autumn Leaves" with its punchy lead guitar riff is also a long time favorite of mine. "Do You Know What Love Is" is a definite earworm with its downstroke heavy chorus and simple, but memorable vocals. The only song on here that I don't totally love is the closer "Long Live Love." Not that there's anything inherently bad about it, but with its jaunty somewhat island vibe to it, I don't think it's as strong as the other three. Regardless, it's a hell of a little 7" and one I'm thrilled to have in the collection finally. I grabbed two other Odd Numbers 7"s from Alan and also bought a few on Discogs to round out the collection, so you have not seen the last of these guys.